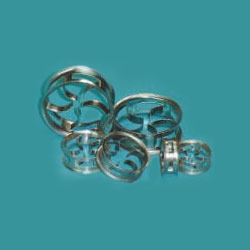 It is a modified design of Metallic Slotted Ring, now being manufactured by us, is much less in cost due to flared thin wall construction and offers all the technical advantages of Pall Rings, V - Pak, Hy-Pak, K - Pak, M - Pak and Cascade Mini Rings and any other type of Slotted Rings being manufactured by others. Data of Metallic Tower Packing given above refers to Standard Gauge Mild Steel on Dumped packing at random basis. Piece count and weights may vary - 5% from above values. The information given above is intended as a preliminary information only and is presented without guarantee or warranty on our part. In actual practice there may be deviations due to special conditions. According to the varied needs of our valued clients, we are instrumental in offering a broad assortment of Metallic Tower Packing Mini Pak. From the beginning of fabrication, these offered products are quality checked on varied quality parameters and are authenticated as per the set industrial norms. All these provided products are easy to fix and requires low maintenance. Our complete range is offered in the industry at economical prices within fixed time frame.